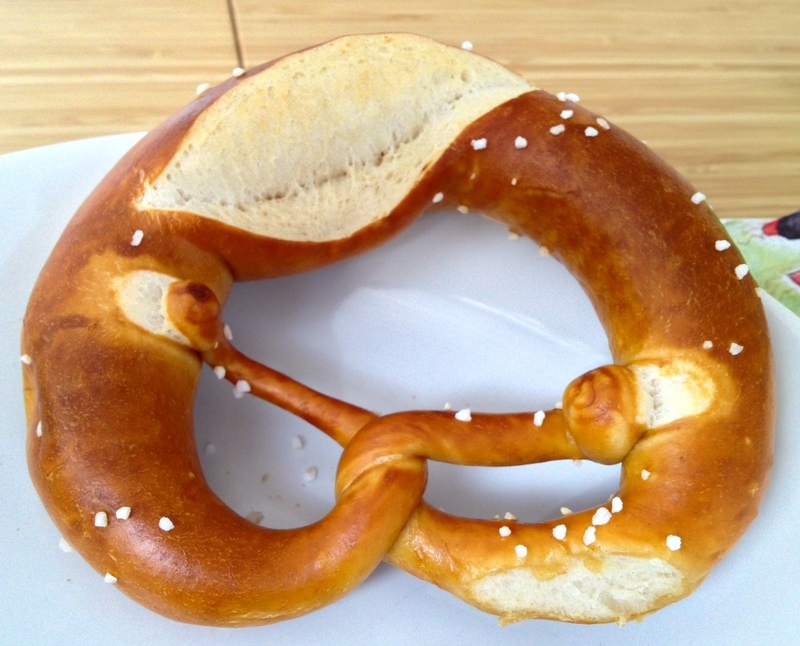 The golden pretzel of Bäckerei Frank. One thing I love about living in Germany is the bread. 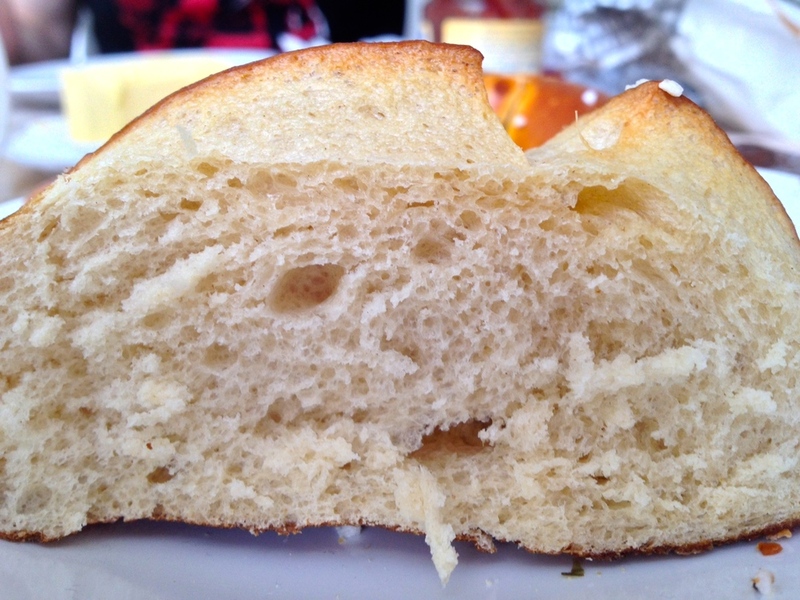 Unlike American Wonder Bread, German bread is baked fresh and comes in a variety of flavors besides "white". In fact, "wheat bread" doesn't exist here, because most of the breads you can buy are a kind of wheat bread, or rather, just bread. In fact, the bread is so fresh that once you slice it, it's really only good for two or three days max until it starts to get stale. I suppose this explains why bread is so cheap, and why it's normal to buy fresh bread every day as you need it. Bakeries are a much bigger deal here than in the States, and it's not uncommon to see two or three on the same corner in a city. We do most of our shopping at that the bakery just outside our local grocery store out of convenience, although I'll also stop at one of the two bakeries on the way to work when I need bread or breakfast rolls for school. I find that the quality at these bakeries is fine for the everyday (and still above what we used to get at our grocery store bakery in the States), but when I have the time, I like to go to my favorite bakery in our neighborhood: Bäckerei Frank. The real thing to get at Bäckerei Frank are the Brezeln, or pretzels in English. They're made fresh daily and are still hot when you buy them. Now these are not your American-style Auntie Anne's pretzels. I have nothing against Auntie Anne's, but after living in Germany for some time, I've come to realize that American-style soft pretzels aren't really pretzels. German pretzels, for one, aren't as salty so that you can actually taste the bread. They've also got the right kind of crusty-outside-to-soft-inside ratio. And whereas the twist in American soft pretzels is the same width as the bottom and sides of the pretzel, the twist on German pretzels is much thinner, giving you a crispy treat after you enjoy the soft body. This explains why when you see German pretzels, they usually appear "upside-down" from American pretzels, with the thick body on the top and the twist at the bottom. I remember the first time I bought pretzels at Bäckerei Frank, the man behind the counter told me in German not close the bag or it would trap the escaping heat and make the pretzels too moist. I'm assuming this is what he said, of course, because my German wasn't really good enough at that point to understand all of it. He said this once, and I didn't quite understand, so I proceeded to close the bag with my warm pretzels inside. At which point, he said it again and motioned to me to open the bag. Then I understood. He cared that much about the quality of the pretzels when I arrived home with them. I actually found Bäckerei Frank because of their pretzels. They have a sign on our street that says they make the best pretzels. I don't know if this is true or not as I haven't tried all the pretzels in Stuttgart, but they are certainly the best I've had so far. The bakery itself is located along a side street on the bottom floor of a gorgeous old building. They even have an old-fashioned sign with a golden pretzel hanging outside. There are benches outside in the warmer months to eat your bread, or standing tables inside for patrons looking for a quick breakfast or lunch. Of course they sell a range of breads, including the customary loaves, pretzels, and rolls. A common German breakfast is to have a selection of rolls served with toppings such as cheese, deli meats, butter, Frischkäse (literally fresh cheese, a kind of cream cheese with or without herbs), jams, honey, and Nutella (chocolate hazelnut spread). My favorite rolls are Laugenbrötchen, a kind of roll that looks like pretzel dough, and Kürbiskern Brötchen, a roll studded with pumpkin seeds. I've eaten rolls with cheese and meat or with butter and jam, depending on what I feel like that morning. But when it comes to pretzels, the rules are a little more strict. Inside a Laugenbrötchen. Note the crispy crust and soft center. My husband frequently has a late breakfast at his office with his coworkers, at which pretzels are a common purchase. Just two or three months after we moved here, he described a conversation that his coworkers had about the proper way to eat a pretzels. There were only two options: with Nutella alone or with Nutella and butter. Matt was perplexed as to why you would need butter (fat) and chocolate spread (more fat) together. But after a taste-test, it became clear: Nutella and butter is the way to go. Yes, it's decadent, but there's something deliciously creamy about the combination, and the butter also helps to soften the sweetness of the Nutella, creating a nice contrast with the salt specks on the pretzel. We're just lucky that Bäckerei Frank has single-serving packets of Nutella for our morning breakfasts, because we can't seem to keep whole jars of the stuff in the house without eating it with a spoon in less that three days time. Tip: How to eat a German pretzel -- First, you should cut the thick body in half a bit like a sandwich, leaving the thinner sections intact. Then, spread on a pat of butter, followed by Nutella spread. Eat the thick body of the pretzel first. When you get to the thin twist, dip it in Nutella to enjoy a crunchy contrast! German bakeries do have sweets, too, but they're not quite the same as in the States. 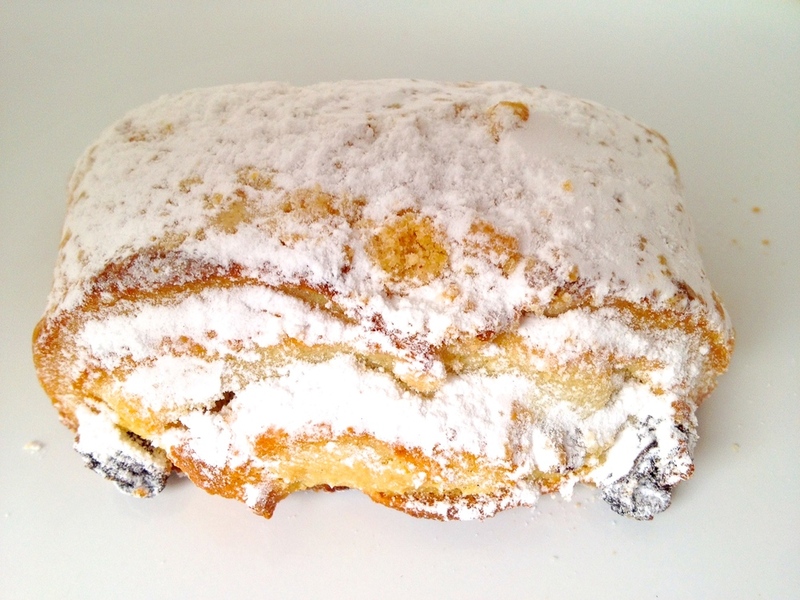 Whereas Americans enjoy cookies and cakes loaded with sugar and topped with thick layers of sprinkles and icing, Germans seem to prefer more bread-like sweets and tarts studded with nuts and fruits and sprinkled with powdered sugar or topped with marzipan. 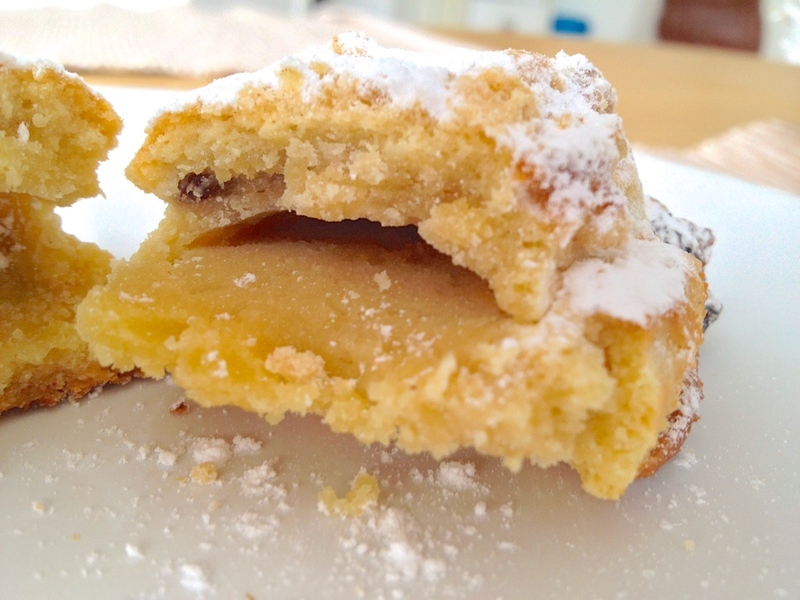 As an example, I purchased a Bobbes at Bäckerei Frank the other day, which is a kind of shortbread dough studded with raisins and filled with what tasted like marzipan. It was delicious, though not quite like the icing topped cookies and cupcakes you find in American bakeries. It takes some getting used to, but I now actually prefer German sweets. And though I crave a good American cake with a buttercream icing at certain holidays and birthdays, I find I can't eat as much as I used to because the recipe is so sickeningly sweet. I suspect this Bobbes had a marzipan filling, though I'm not sure. Either way, it was tasty! Bäckerei Frank is located on Wächterstraße 9, although there are two other locations in the city in Stuttgart Süd and Untertürkheim. It's just a block from the Dobelstraße U-bahn stop. Look for the sign on Hohenheimerstraße for directions. Note that they close on Saturdays at 1pm, and like most German bakeries, they are closed on Sundays. Enjoy the pretzels, and let me know if you find any better ones in Stuttgart!